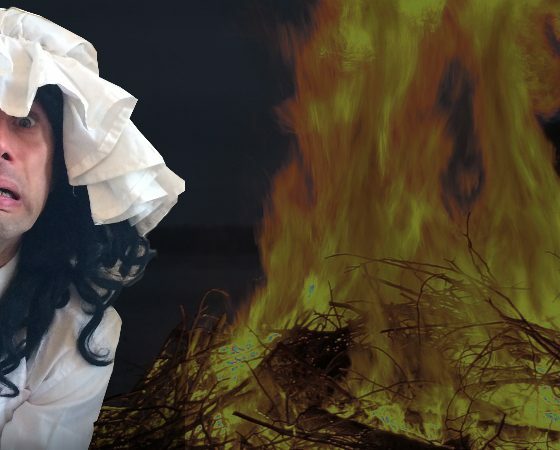 Sleepy little Cornish village Morlington Hill is about to embark upon its annual bonfire celebration, ‘The Burning of the Bush’, when someone spots an arm sticking out of one of the bonfires. Help the local police investigate one of the most bizarre and shocking murder mysteries yet! 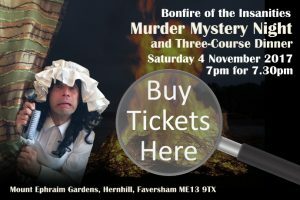 Following on from last year’s sell-out success ‘The Fall of the Pollocks’, join us on Saturday 4th November 2017, 7pm for 7:30pm at Mount Ephraim House, Staple Street, Hernhill, Faversham, Kent, ME13 9TX for a night of drama and a delicious three-course meal, prepared by Corinne’s Creative Kitchen (Taste of Kent award winner) and Chetna Makan – the Great British Bake Off 2014 semi-finalist. During your meal the drama will gradually unfold as colourful and entertaining characters (played by professional actors from 368 Theatre Company) introduce you to a world of mystery and intrigue. Over coffee you are invited to fill in your murder enquiry form, and then – in true Agatha Christie style – the murder is re-enacted and an accusation made. At the end of the evening, the table that has spotted the most clues wins a prize. Bonfire Of The InsanitiesTickets cost £38, with all proceeds going to Khushi Feet, helping to provide an education for children living on the streets of Kolkata. Our last Murder Mystery evening was sold out well before the event so buy your tickets now! You can buy online (subject to a 0.75p credit card charge), or order your tickets if you are able to pay for and pick them up from Faversham. We look forward to welcoming you to Mount Ephraim for an evening of murderous fun.